Sorry MV Scuba Adventure is no longer sailing/ not running trips. MV Scuba Adventure can claim to offer everything. Of all the liveaboard diving boats which sail to the Similan Islands & Richelieu Rock, there are very few which also visit Thailand’s 2nd & 3rd best diving areas, commonly known as Hin Daeng & Koh Haa. Of the few that do visit both areas, only MV Scuba Adventure can combine the best value with a personal service, because only twelve lucky guests join each competitively-priced trip. Air-conditioned twin-bed and double-bed cabins, a professional yet friendly crew & staff, and sumptuous buffet meals make for what some regard as the best liveaboard safari boat in Thailand. 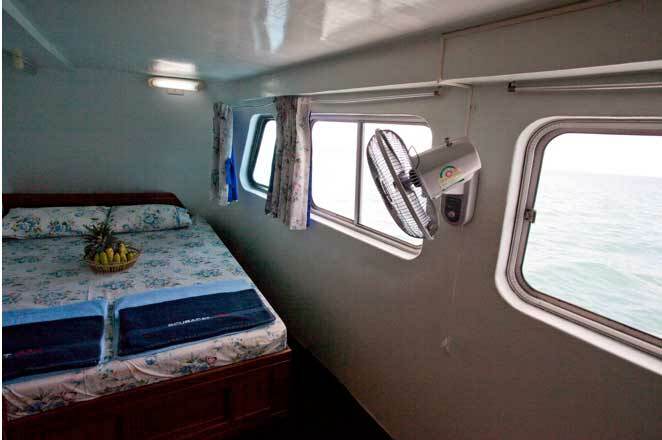 The boat is 23m long, not as large as some other Similan liveaboard diving boats, but considering that there are only twelve guests on each trip, there is plenty of space to sleep, socialize, move around, and find some privacy. 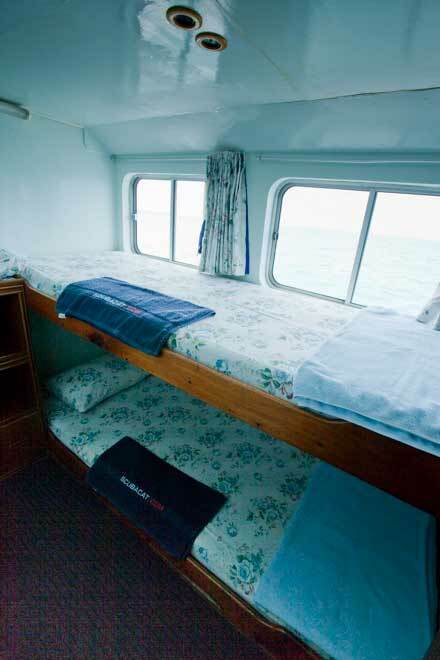 The decks include a large dive platform, dining areas, shared bathrooms & air-conditioned cabins. A full set of safety equipment is always on board, and the captain, crew, dive staff and chef are all experienced and service-minded. 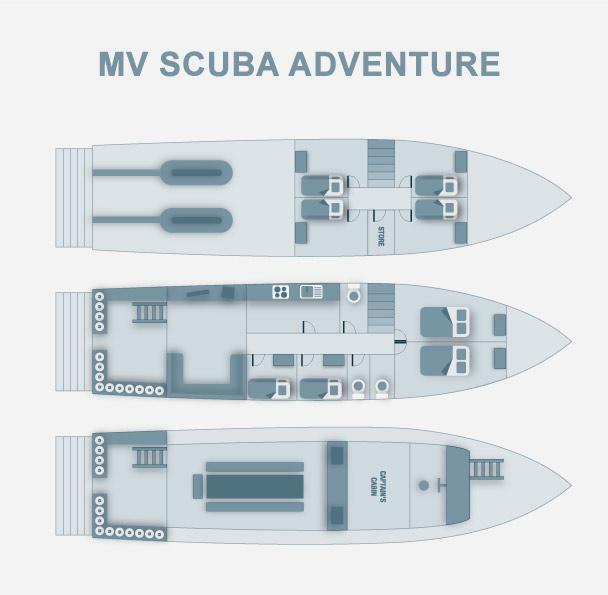 Although MV Scuba Adventure ticks all the right boxes with regards to comfort, service, safety and price, the best thing about this boat is the choice of trip length and location. As well as offering the standard 4D/4N 14-dive trips to The Similan Islands & Richelieu Rock (including Koh Bon & Koh Tachai), guests can also opt to join the cheaper but no less exciting 3D/3N cruises to ‘The Southern Islands’ of Hin Daeng, Koh Haa, & the best dive sites around Koh Phi Phi & Phuket. 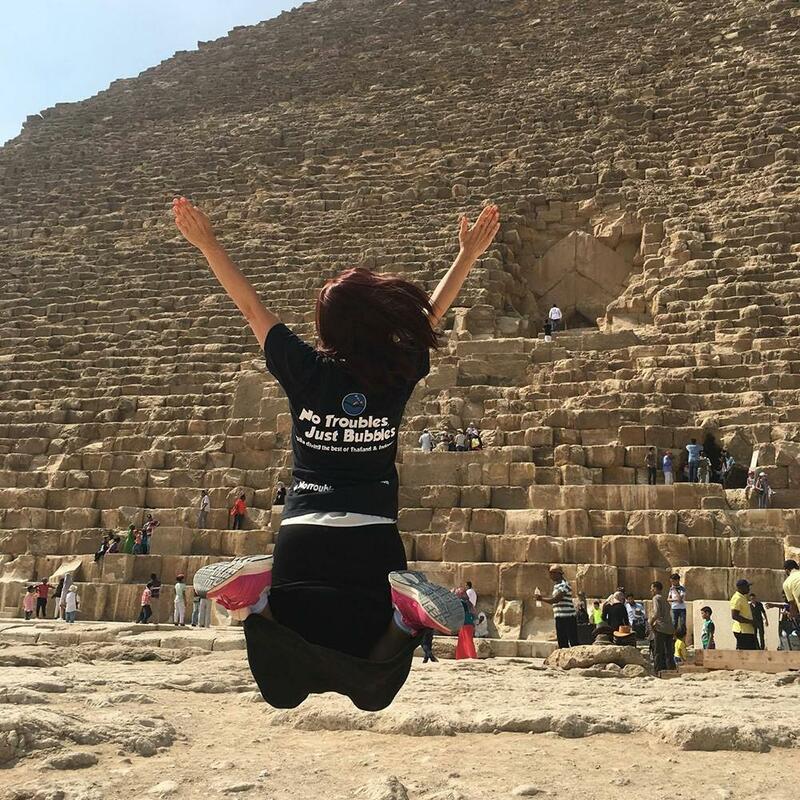 It is no surprise that many of our guests decide to book 7D/7N cruises on MV Scuba Adventure, enjoying the best of everything. During the diving season (Nov-May) most MV Scuba Adventure trips alternate between The Similans & the Southern Islands, enabling guests to stay on board and see all of the best dive sites Thailand has to offer. Now for the new 2016-17 season, there will be trips in Myanmar (Burma). During the 'low season' (sometimes referred to as the 'green season') Scuba Adventure sails around the best dive sites of Phuket and Phi Phi, offering a choice of short trips. There is also an unbeatable-value cruise + Open Water Course package! Please contact us for details. 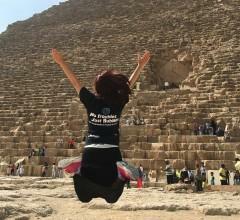 The team will come to your hotel, resort or guest house and collect you at around 5pm on the day of departure. MV Scuba Adventure sails from one of two piers, which are Chalong in Phuket and Tab Lamu in Khao Lak (100km north). Guests are introduced to the staff and crew and allocated cabins. The boat sails into the night, while guests get to know one another and enjoy buffet dinner. The boat arrives at the dive sites around midnight and guests wake up ready to dive. The diving starts at around 7.00am on most days. The very first dive of the trip is known as a ‘check dive’ and takes place at an easy dive site. 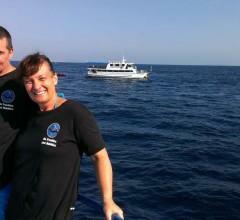 Here the cruise leader, with the help of Divemasters and instructors, assesses the true ability of the diving guests. This mainly includes air consumption rate. From that the divers are placed into the best groups to maximize everyone’s time underwater. Of course, couples and friends want to dive with each other, and the groups are rarely fixed for the duration of the cruise. There are four dives per day for the first three days (3 day dives and one sunset/night dive), then on the fourth and final day there are two dives before the boats heads for home. Trips normally start in the middle of The Similan Islands archipelago and work their way north before turning around after dives at Richelieu Rock, Thailand’s best dive site. However, for a variety of reasons, the order of dive sites visited may change. The trips out to the south and east of Phuket are slightly shorter but no less fun. Naming them ‘Hin Daeng Trips’ is also an injustice. These 3D/3N trips take lucky guests to the best diving sites of Thailand which are not far out to sea. Hin Daeng refers to two great pinnacles known as Hin Daeng (Red Rock) and Hin Muang (Purple Rock). The trips also visit Koh Haa, which is a group of five uninhabited islands further east. The diving at these two locations is always excellent, and there is more variety and opportunity for less experienced divers around Koh Haa. In addition the best diving sites of Koh Phi Phi and Phuket are also dived during this trip. The itinerary is similar to the Similans cruise, in that guests are picked up in the afternoon, the boat sails at night and there are four dives per day, except the final day on which there are two, before the ship returns to port in Phuket. Construction 23 Meters Overall Length, 5.5 M Wide, Refitted Specifically With Diving In Mind. Speed 10 Knots, Maximum 12 Knots. Engines 2 X Hino 320 HP. Passenger / Crew Capability Maximum Of 12 Guests With 5 Boat Crew And Dive Crew. Safety Features And Equipment MV Scuba Adventure Has A Complete Supply Of First Aid Equipment, Including A DAN Oxygen Kit With Demand Valve And Large Oxygen Supply. Life Raft For 25 Persons. The Crew Are Able To Communicate With The DAN Hotline If An Unlikely But Necessary Circumstance Should Arise. Scuba Cat Is Affiliated With Two Re-compression Chambers In The Phuket Area. Life Vests Are Readily Available For All Customers And Crew On Board. Electronics Marine Radio, Radar, Sonar, GPS, Depth Finder, Fish Finder, CCTV, Generators 1 X 30K, 1 X 40K. Fresh Water Capacity 9,000 Litres. Amenities 220 V AC Current With 2 Pin Sockets In Cabins And Most Other Connections Available Elsewhere On Board. Spacious Salon With TV, DVD And Stereo. Dive And Additional Equipment Nitrox, 36 Scuba Tanks Both DIN And Yoke Fittings, 1 Inflatable Tender, Rental Of All Essential Dive Equipment Available, 2 X Coltri Sub Compressors. Food And Drink Scuba Adventure's Delicious Cuisine Is Included In The Cost. Three Meals A Day Are Served Buffet Style Along With A Light Breakfast Served Before The First Morning Dive, Another Snack Before Second Afternoon Dive And Again After The Night Dive. Coffee Tea And Water Are Provided Throughout The Day. A Small Charge Will Be Made For Any Soft Drinks Or Beer After The Day's Diving. There are several courses available on MV Scuba Adventure, including PADI and SSI certification. The prices are extremely competitive, and cheaper than completing on land-based day trips. While PADI are considered to be the most-popular diving organization in the world, SSI are the fastest growing and preferred by many customers and dive centres for a number of reasons. 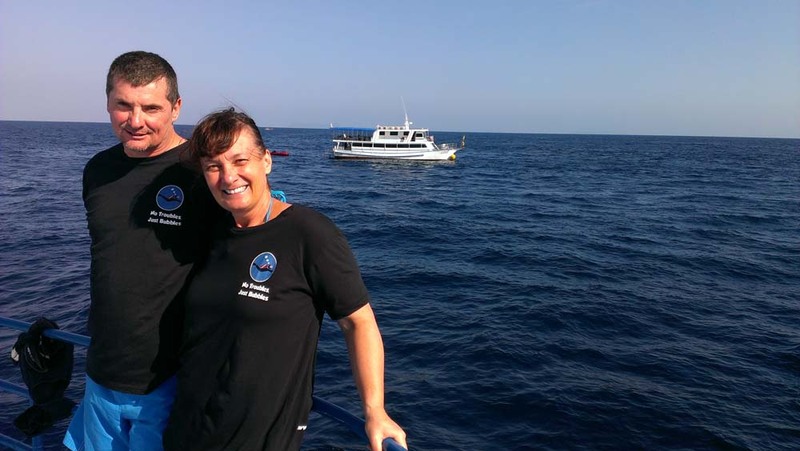 There is no need to worry about becoming certified by one (including CMAS, NAUI and all others) and then diving with a dive centre which uses another. 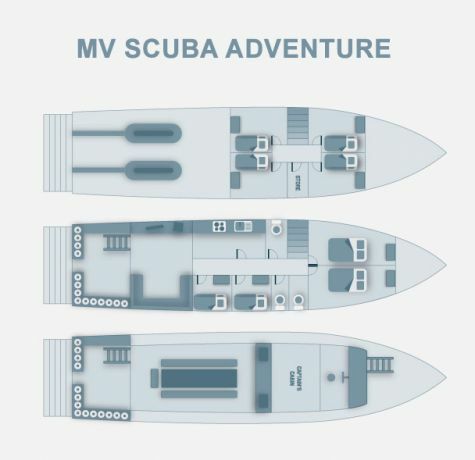 The course prices below are taught on board, and the included dives are part of the diving cruise, not in addition to the number of cruise dives. Guests taking part in the course are led by a PADI / SSI Instructor, instead of a Divemaster guide. * Open Water and/or Advanced Open Water courses can also be taken aboard 3D/3N trips to Hin Daeng & Koh Haa (with a saving of 5,000 THB on the Similan trip prices), as well as on the 7 day supercruise. Please enquire for prices. Open Water divers joining the liveaboard trips also need to take part in the Adventure Deep Dive (or Advanced course) to enjoy the depths which other guests aboard MV Scuba Adventure dive to. Scuba Adventure guests can take advantage of free scheduled transfers from a selection of hotel & resort areas. It depends on where the boat is sailing from (sometimes Khao Lak and other times Phuket) and the exact location of the guests' hotels. However, in most cases, there are free (or inexpensive) transfers available. Please contact us for more details. Clean & simple, but very well organised. Prices include full-board accommodation, all meals and most non-alcoholic drinks throughout the cruise. Divemaster services, weightbelts & weight, and 12-litre tanks are also included. Guests who do not have their own diving equipment can rent a full set for 500 THB / diving day. National Park entry and diving fees apply, and must be paid in cash upon arrival. 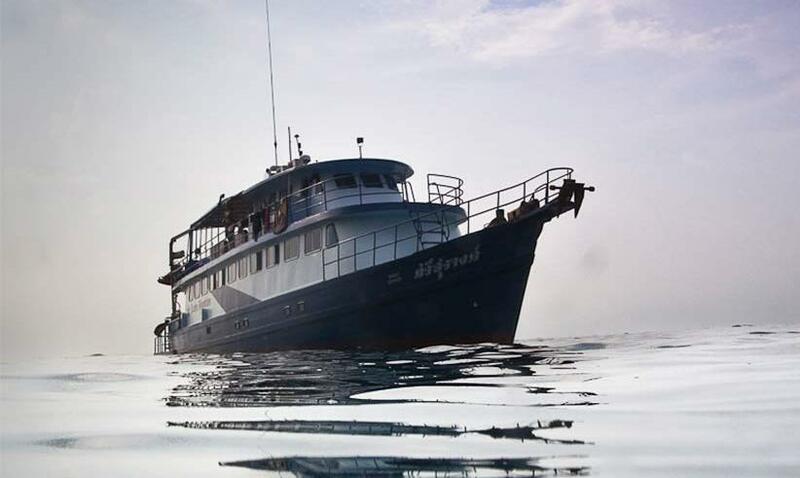 Non-divers enjoy the largest discounts of any Similan liveaboard, normally 30-45%. Please ask for details. Single supplement (for those wanting a cabin to themselves) is 50% of the cruise price on top of the cruise price. MV Scuba Adventure has space for 14 guests but only takes 12 maximum, just in case a solo male and solo female want to join the trips.